Any news about non-theme park attractions can be found in this section. Happy 2015: the year of Laff Trakk at Hersheypark. 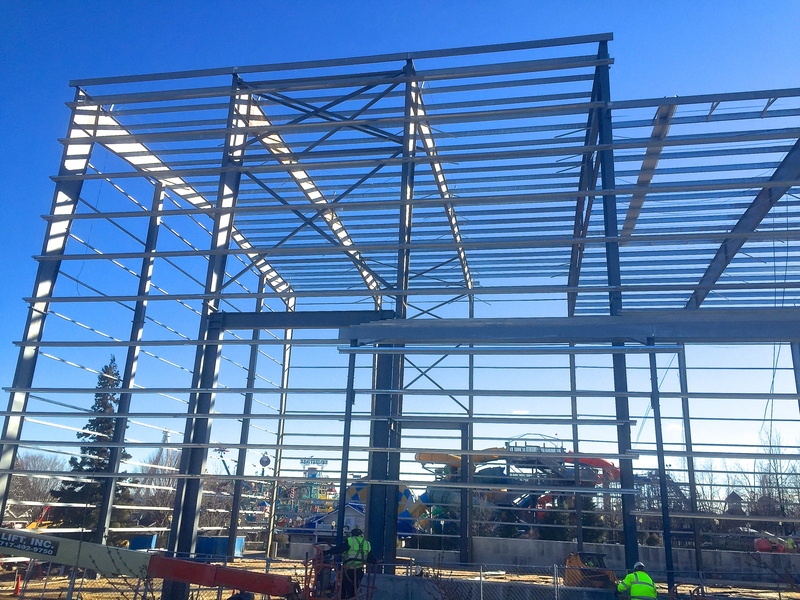 None of the ride has shown up yet, but more of the building is starting to take shape. More framework for the walls are starting to go up, the station area looks like it is starting to gain a roof, and the framework for the transfer area seems to be going up. 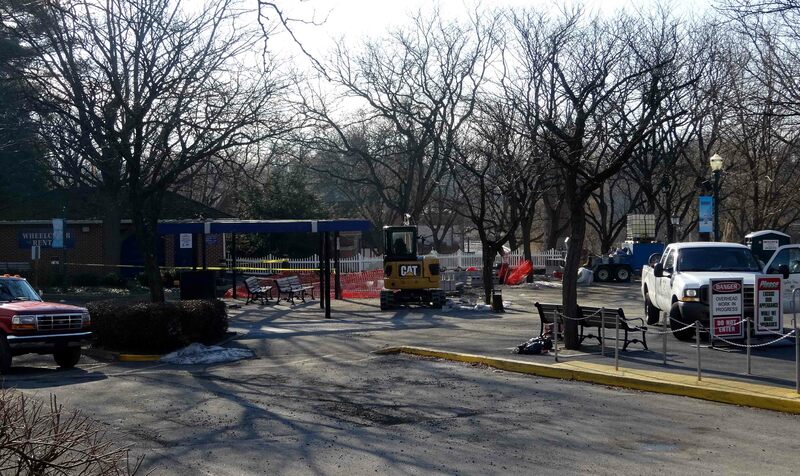 Hard to tell what is happening in front of the building, but it looks like a covered queue will be erected out front next to the path that headed to the Midway Tent (you can actually see construction crews moving a building support into place near one already installed). 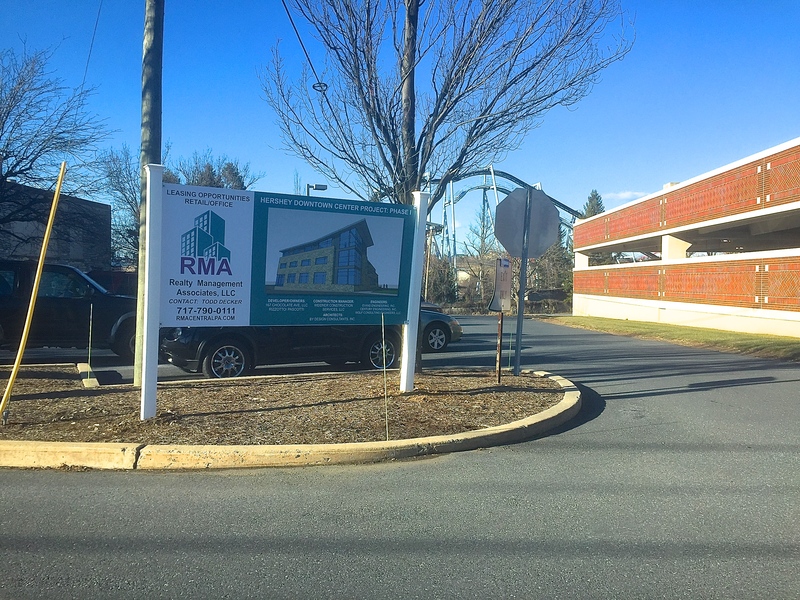 Elsewhere in Hershey, construction signs have gone up showing renderings of a building called the Hershey Downtown Center. The Post Office looked to be still open, but there weren’t mail delivery vehicles to be seen like there used to be. 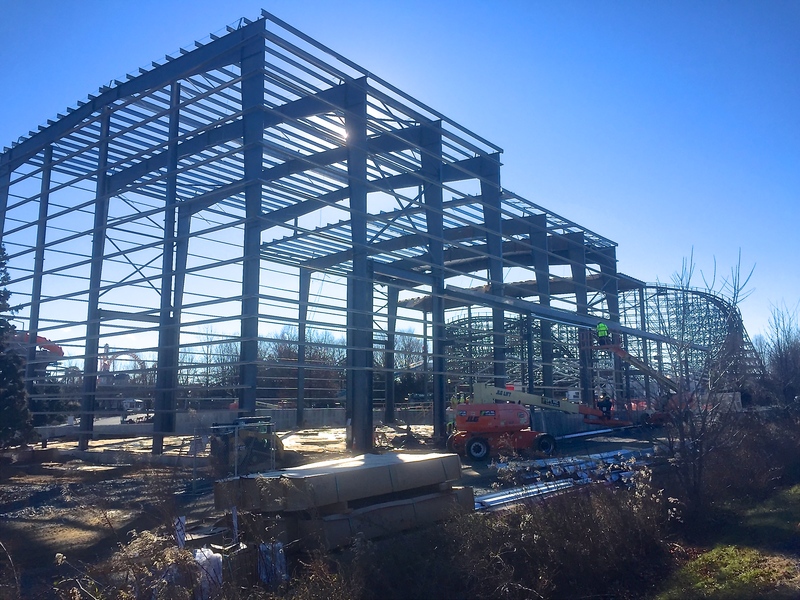 Construction should begin soon and the end product will be a building with a more attractive appearance, new food, retail, and business offerings. An Appalachian Brewing Company will be added with a view of the neighboring park. 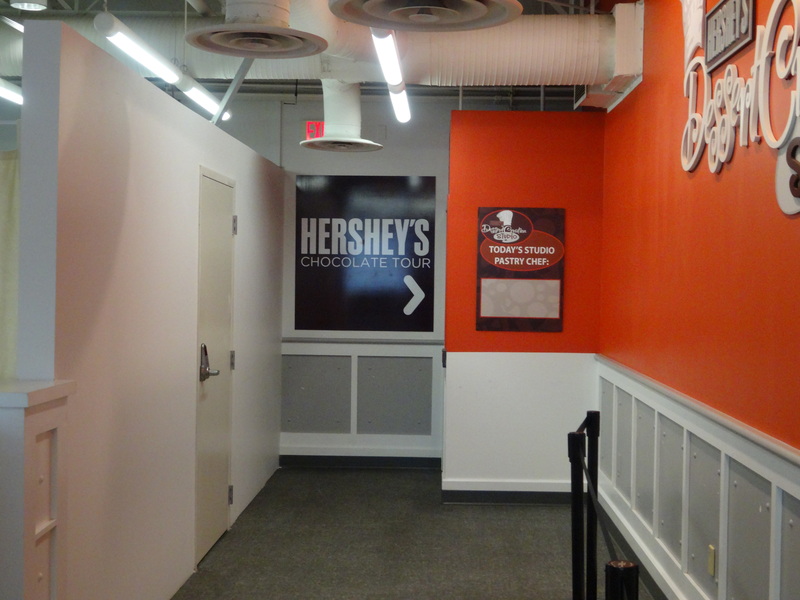 A new Hershey Company sign has gone up at the former factory. 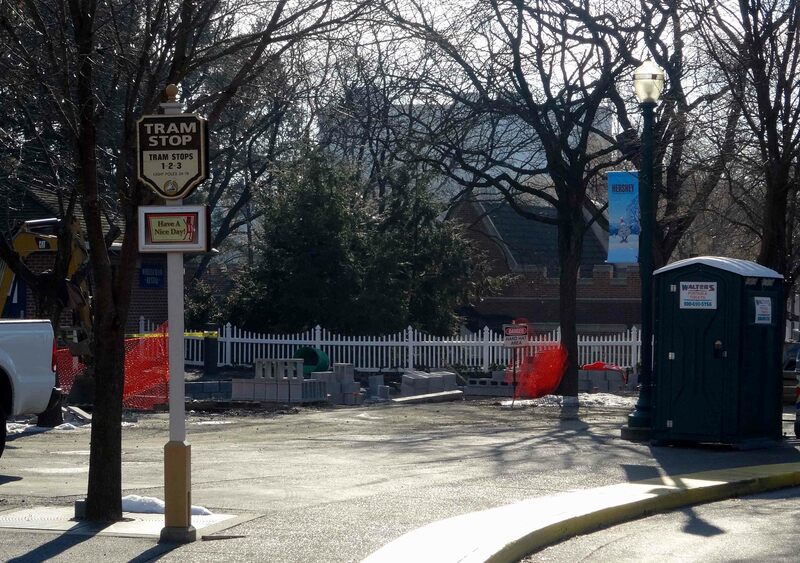 The sign looks like it is in front of the Monorail so it looks like there is a potential for a pretty cool picture of it whizzing past come Spring. No track pieces yet, but it probably shouldn’t be long now. I’m guessing what’s laying out front in boxes might be siding for the building. Looks like construction crews might be starting to go vertical with a queue building. 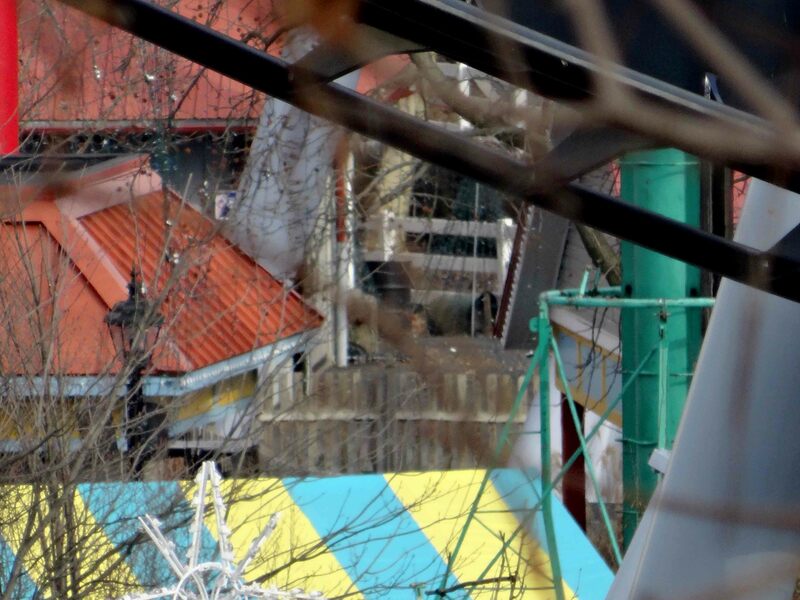 You can see a lone beam sticking out in front of Wild Mouse and the crane bringing over a beam on the right. I am wondering what the think beams on the side of the building will be? Decorative windows perhaps? That’d look cool. Looks like the Downtown Center Building will fit in pretty well and give people more to visit in the town. 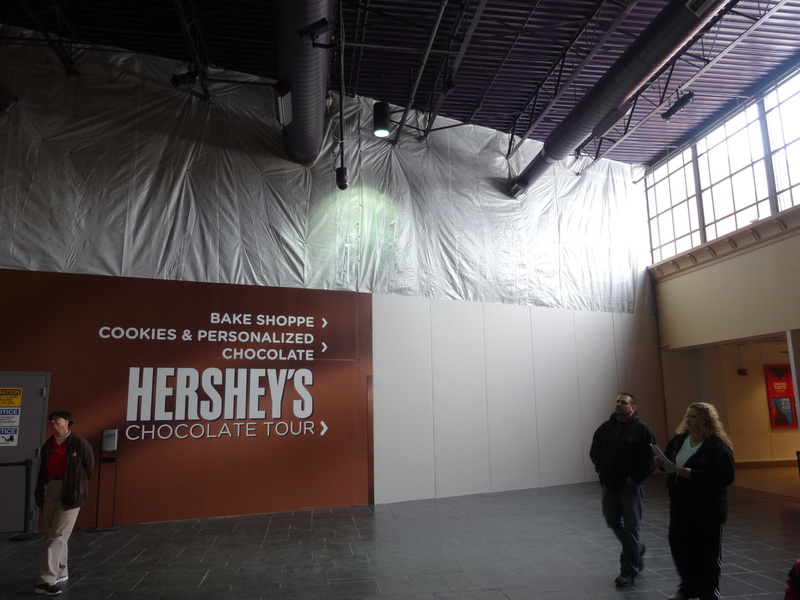 Thanks for reading and be sure to check out my Hershey of the Future post for more about the Downtown Center Building and other possible happenings around town. 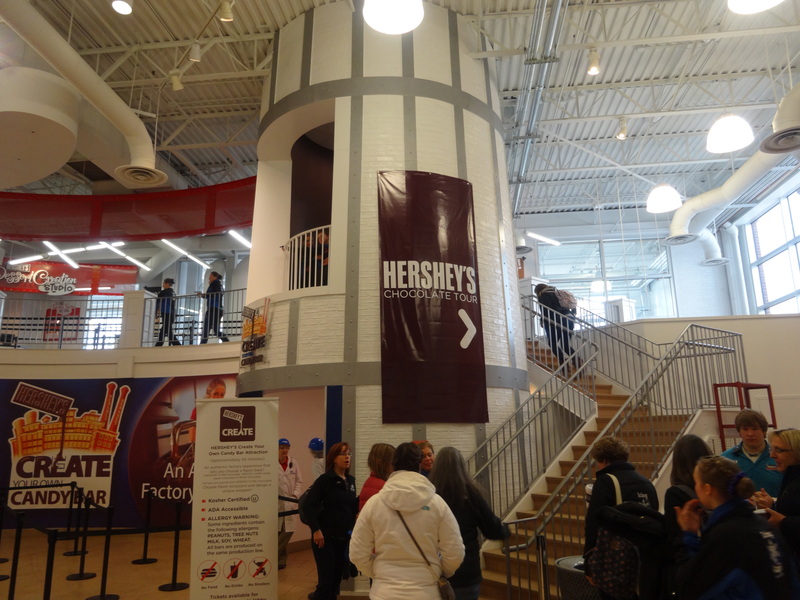 The Hershey of the Future: A Look at Planned and Possible Building Projects for Hershey. 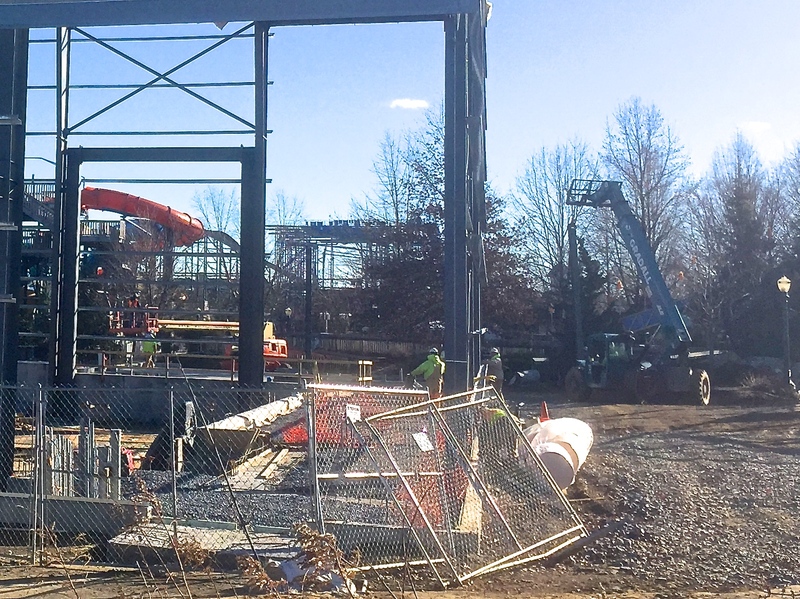 Starting to go up in Hersheypark’s Midway America section is a building that will house Laff Trakk, the park’s 13th roller coaster. 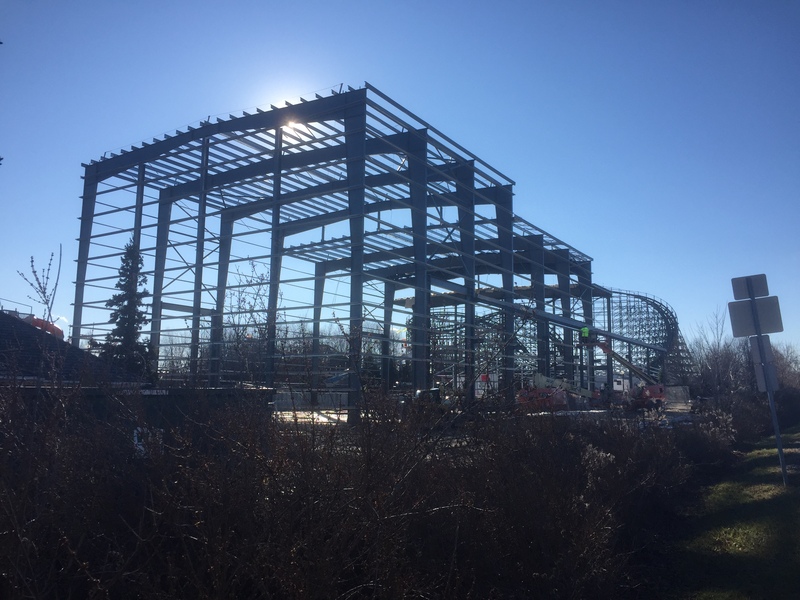 The ride will be the first indoor, spinning, glow roller coaster in the United States. The framework for the building looks mostly erected at this point with the ride itself nowhere to be found as of late. 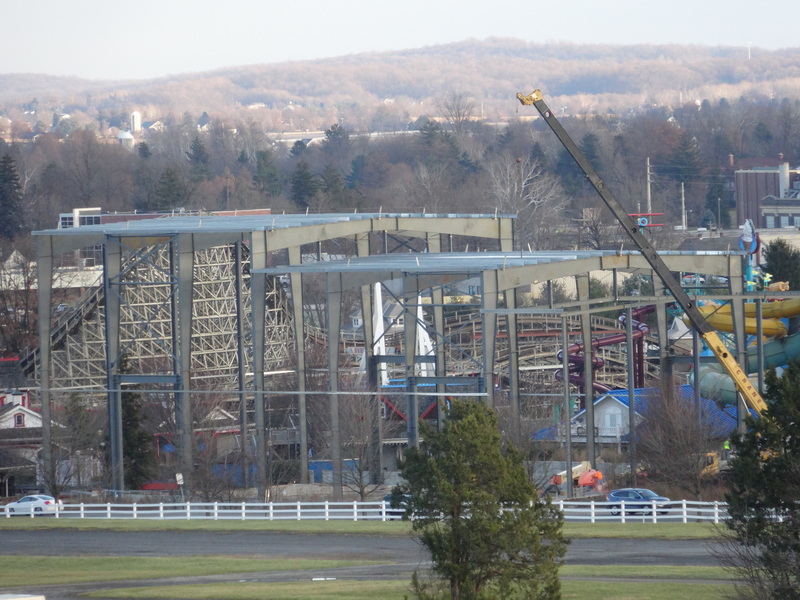 Hersheypark hopes to have the ride open sometime in May 2015. The info page for the coaster lists it as having a 42″ (Reese’s) height requirement, max height requirement of 6′ 5″, and a ride rating of 5. 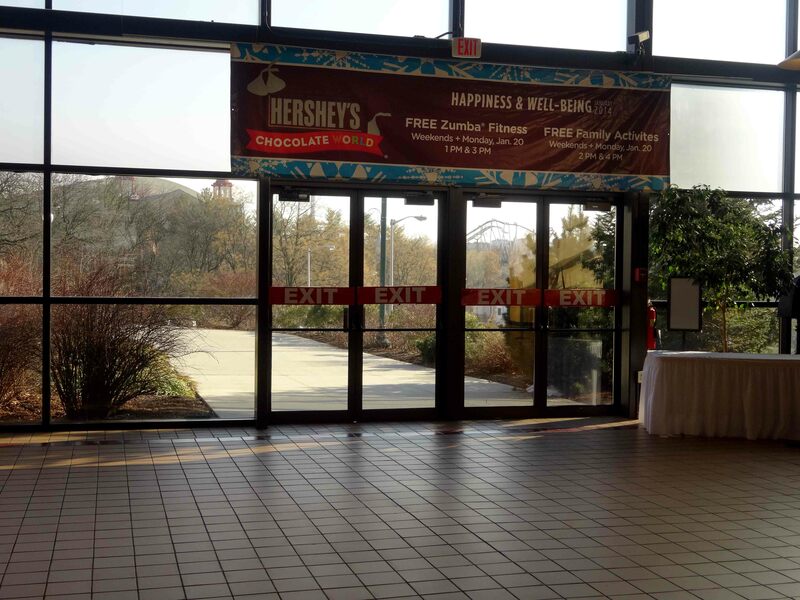 Ever since Parkview Golf Course closed in 2005, there have been rumors on Hersheypark possibly being able to expand across Park Boulevard and into the 130-acre former golf course. 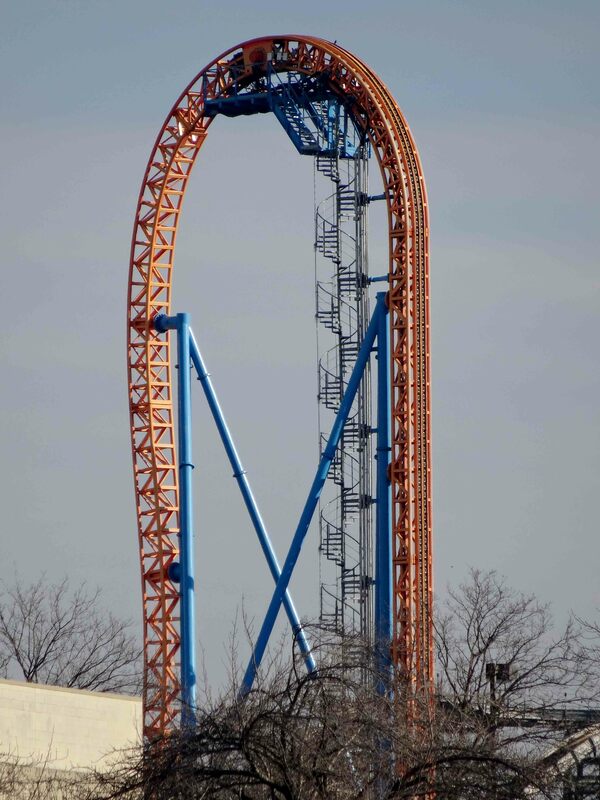 You can read more about what CoasterBGW posted in his Hersheypark Over the Next Decade article that goes into more detail on its history, but as of late, the project has been funded and construction is scheduled to start as of early 2016. The submitted plans appear to show a road heading straight from the Hersheypark parking entrance split and crossing a bridge over the creek. A portion of the existing road will stay to serve as an entrance to Chocolate World and will meet at the new road section as an intersection. Other features include a possible northbound entrance to the park’s parking lot, sidewalks, and the possible opening of public traffic to travel from the Ridge Rd. bridge to Park Ave. (Route 743). 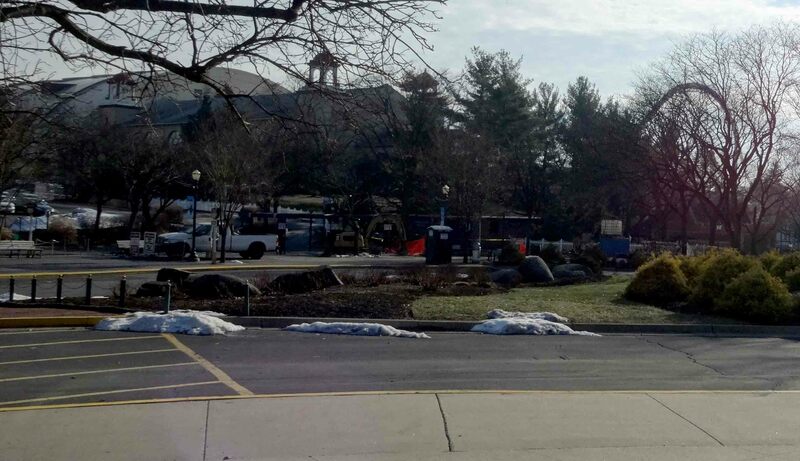 It does seem like something has happened with this project as I have started to spot a series of construction/surveying stakes in between Chocolate World’s entrance and the Hersheypark parking lot split. These have recently showed up within the past few weeks so it could mean that it is still on-track. As someone who frequents this road and knows how busy it can get, I am really looking forward to this one as it could possibly improve traffic after the park or a Bears Hockey game lets out. On a sidenote, the realignment would add around 30 acres to the area next to the park. Nothing has been said about the park expanding this way as of yet and probably won’t be anytime soon. 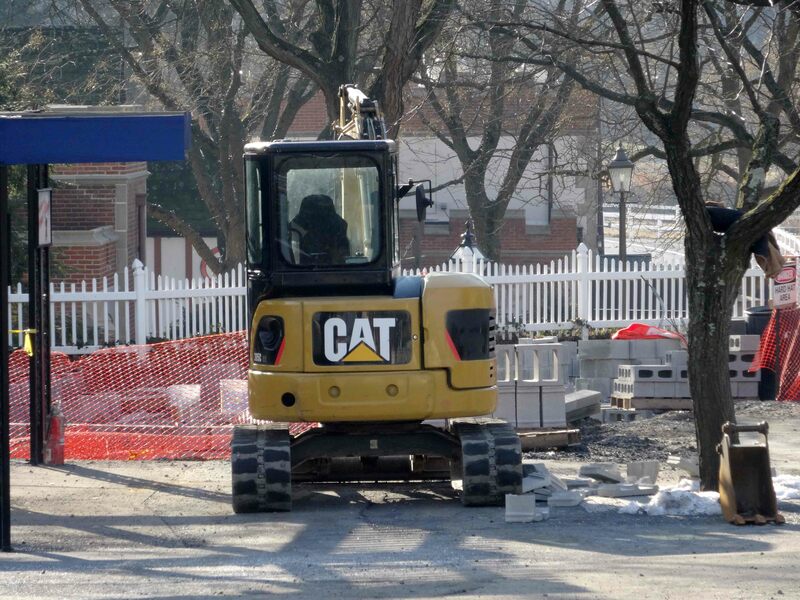 Within the last few years, the center of downtown Hershey went through a large amount of road improvements with re-routing Cocoa Ave, the construction of a new bridge on Park Ave. over the railroad tracks, the re-do of a portion of Chocolate Ave., and the construction of two underpasses. The aftermath has left a decent portion of open space next to the Hershey Theatre and a nice updated stretch of Chocolate Ave that sticks out from the rest of the town, which hasn’t been updated for years. In early 2014, the Downtown Hershey Association was created to improve the appearance of downtown as well as the quality of life for its residents. After polling many of the town’s residents, a series of conceptual drawings were made to take a look at what people wanted. Many of these features include new plazas, shaded seating areas, decorative sidewalks, art, and much more. 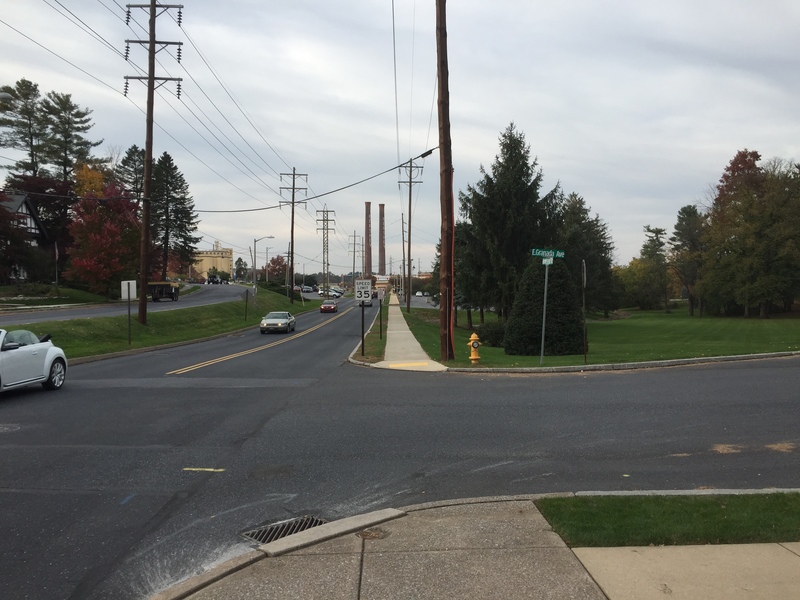 In a recent story posted several weeks ago, it seems that Chocolate Ave. will be re-paved and Derry Township is looking into conducting a study to figure out costs and funding for these beauty enhancements. 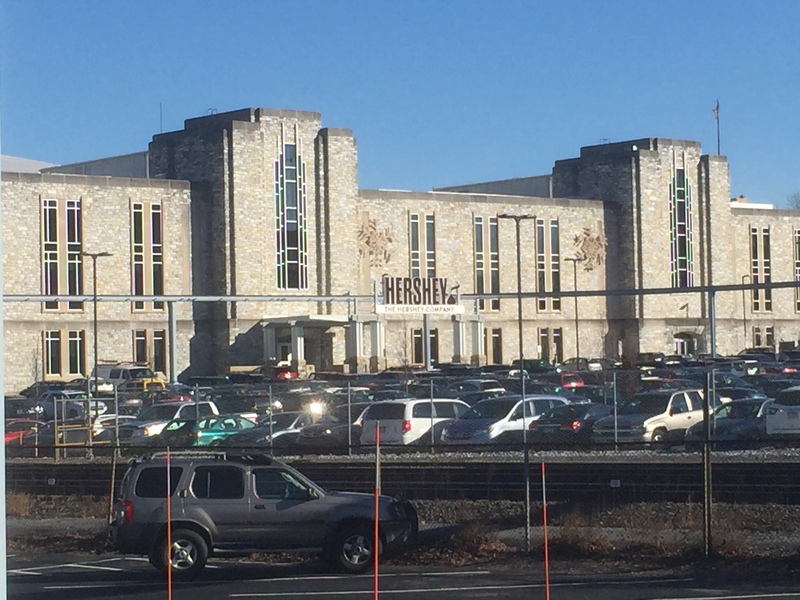 In early 2013, the Hershey Trust Co. announced that they were going to sell the property that the Hershey Post Office resides on. The ones who bought it, a group known as the 169 Chocolate Group, plan on renovating the building by changing the facade, bringing in several restaurants, retail businesses and offices. So far Appalachian Brewing Company will open a brewpub in the basement of the building, the retail store for the Post Office will be welcome to return, and the developers say that they have nine tenants that may move in. 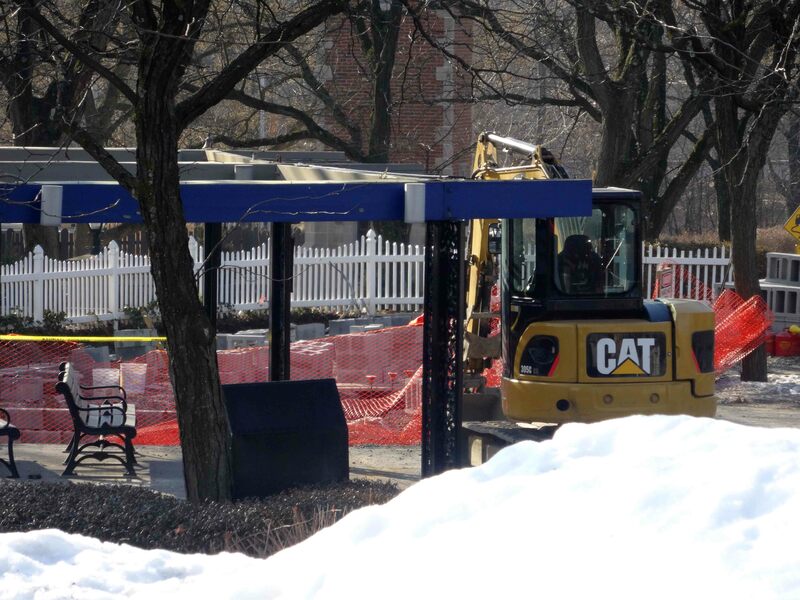 According to an August article, work is expected to begin this month and the renovation could take about a year to do. It is also mentioned that new buildings could be added for more space in a second phase that could begin within the next two years. 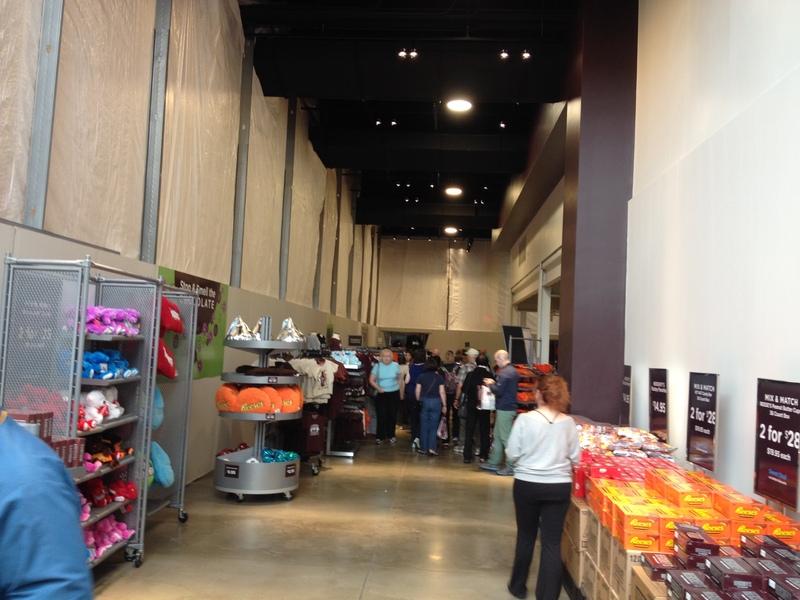 In 2012, the Hershey Company moved its production to its West Hershey plant and vacated much of the building. 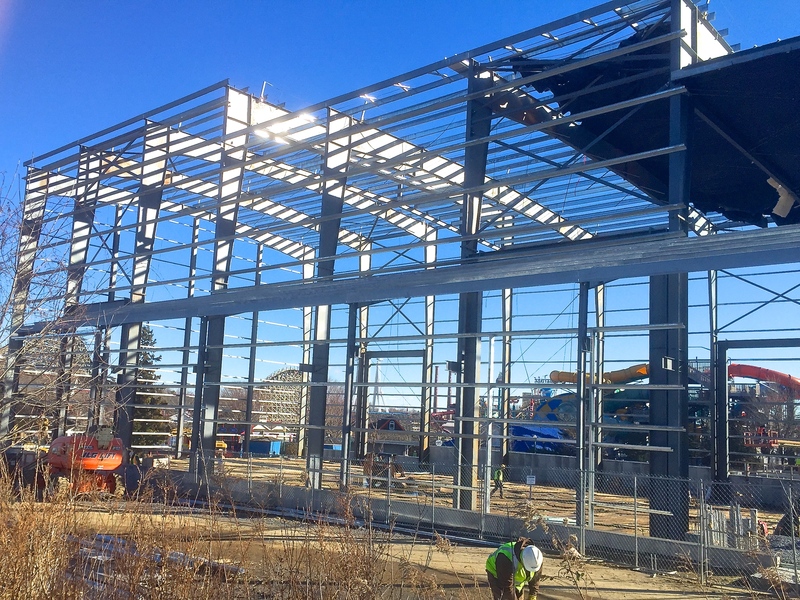 After trying to find a buyer to re-use the former factory to no avail, the newer section of the building was torn down and much of the former section was renovated into office space for the company. According to the developer for the site, Tim Harrison, he is considering an area mixed of restaurants, retail, and entertainment for the area that was demolished. It was also mentioned that parking structures could be added to get parking under control as well. As of August 2014, there haven’t been anything official on what could happen with the site. Near the former factory, the cocoa bean silos that dominate much of the skyline are available for renovation. They were bought in 2012 for $100,000 by a group of four families who want to preserve the silos, seek a developer, and renovate them into condos, a hotel, or some other form of venue. 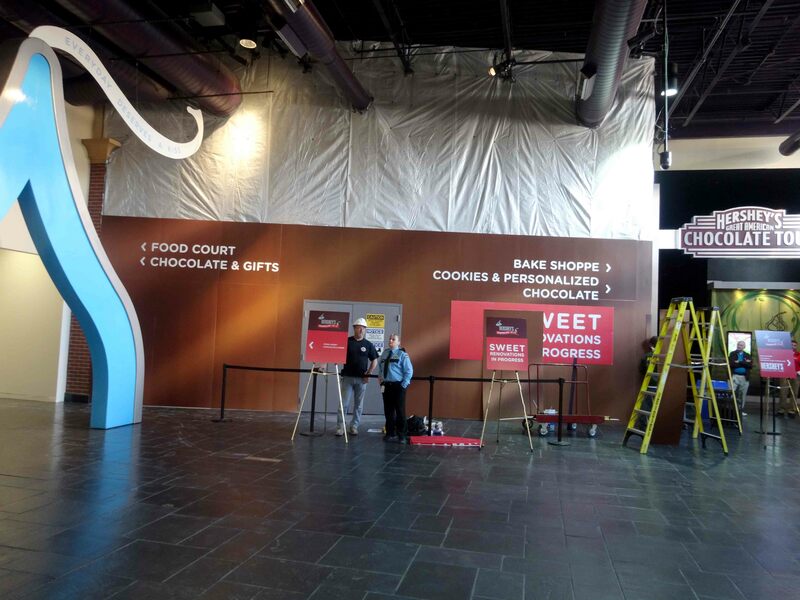 With the summer season only days away from beginning, work over at Chocolate World appears to be slowly coming to a close. While the construction walls haven’t all come down yet, work on the other side of them seems to be just about finished. 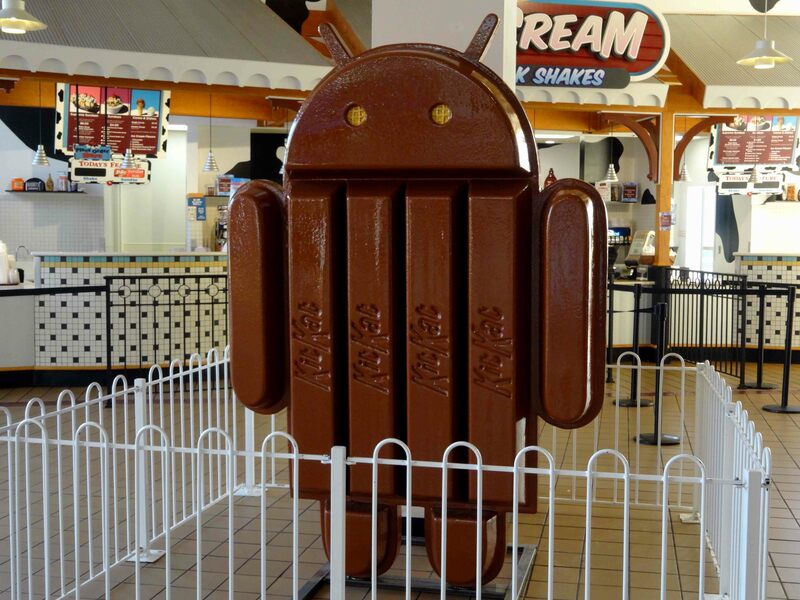 Poor KitKat Android is now resting in the far corner of the Dessert Studio. 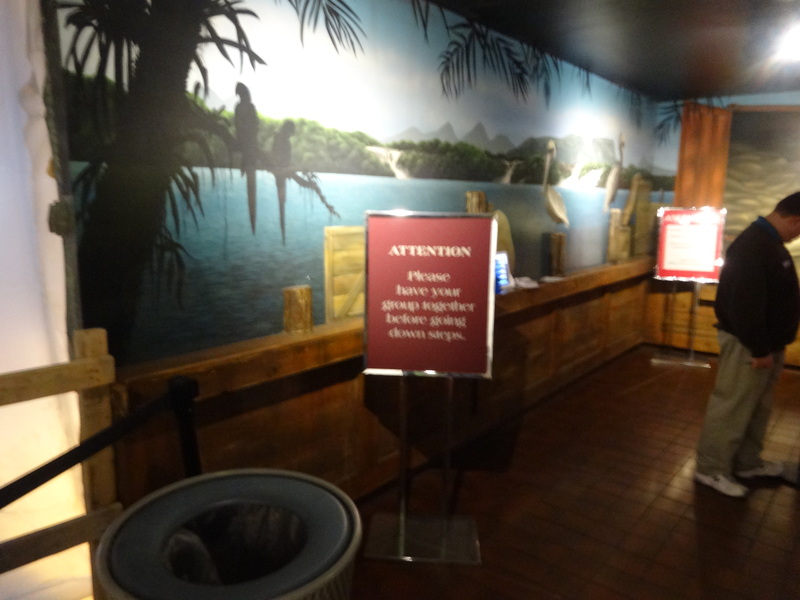 The Dessert Studio still has the Tour Ride queue running through it, but once you enter the hallway, things change. 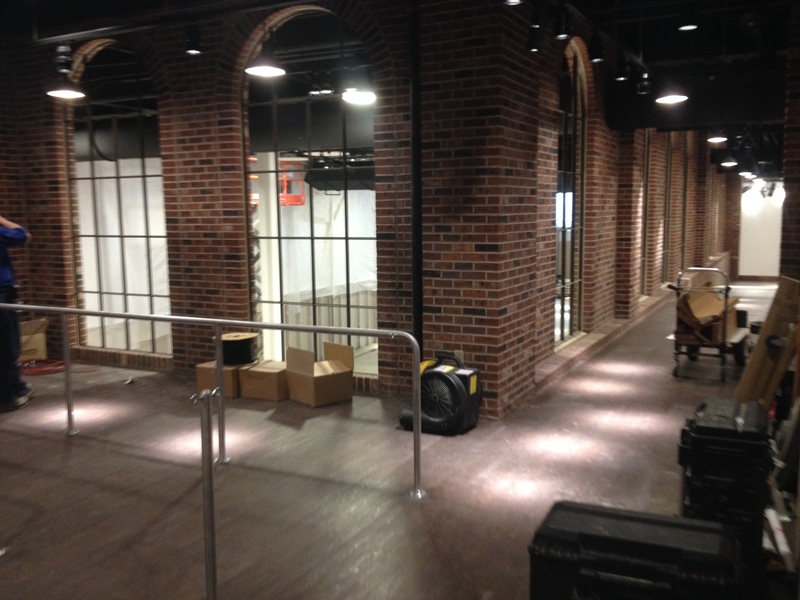 Wooden floors have been added, the former rainforest area is now a level switchback queue area with brick walls and large windows overlooking the new retail area (that half is still blocked off). 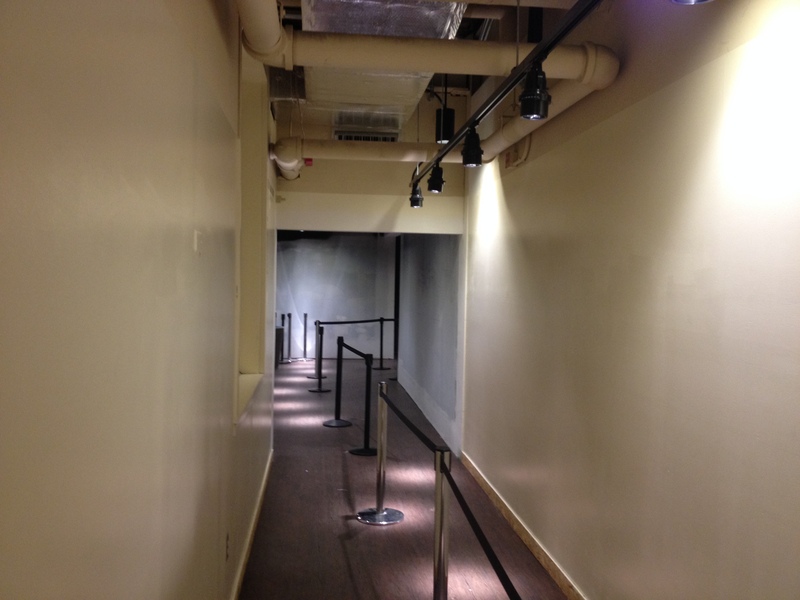 The former fire exit hallway now has some new lighting and wooden flooring. 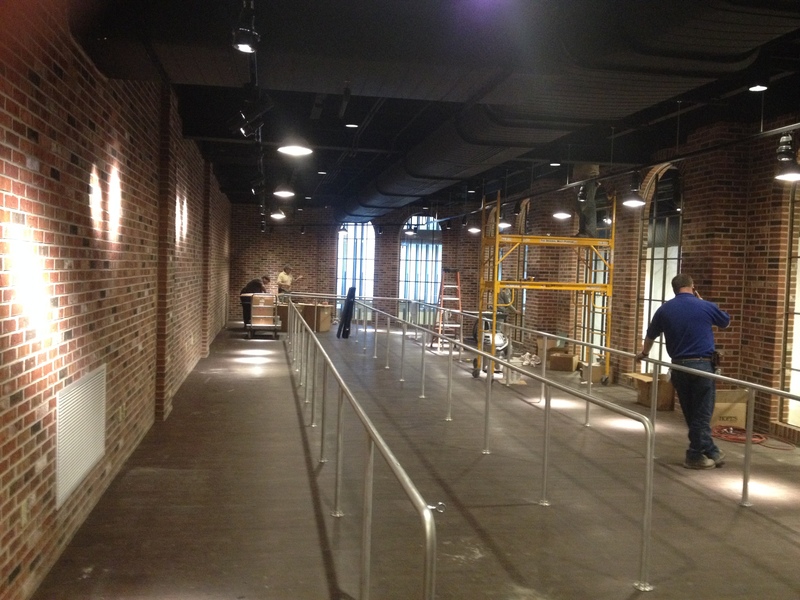 Check out the spiffy new queue area! Looking sharp! 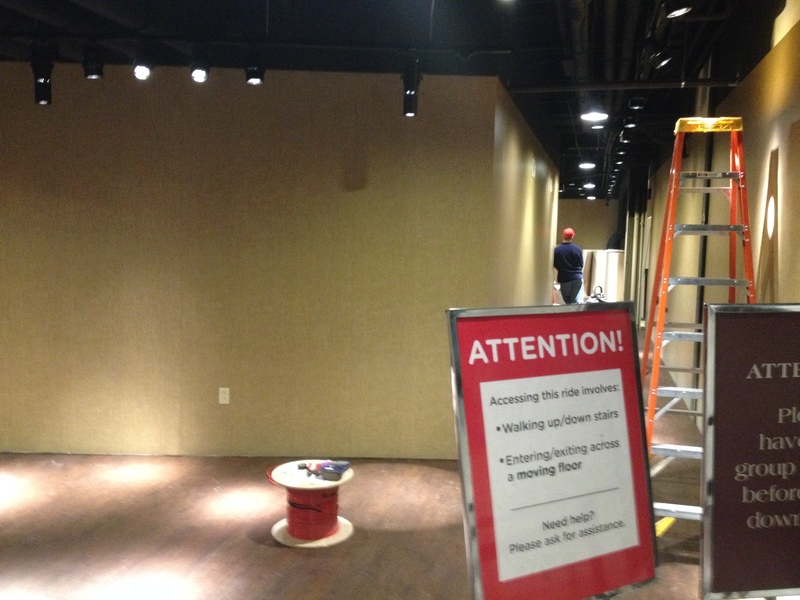 Looks like there’s not much left to do in the retail area. Here’s a peek of the new entrance ramp. The area across the hallway seems to be coming along nicely. Should be interesting to see what details will be added. Out with the old, crappy wooden railings from the 70’s and in with the new, clean, metal ones. A small section of the old mural is still there. 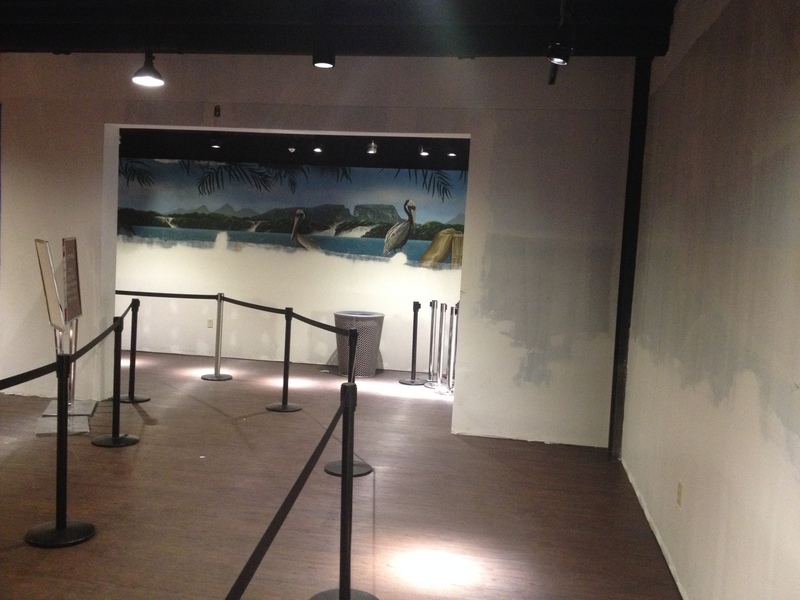 Many of the walls have been painted or are currently being painted and the only thing left from the original harbor mural are a few pelicans along a far-back wall. Can’t wait to see what details will be added to the queue as it already looks really nice so far. 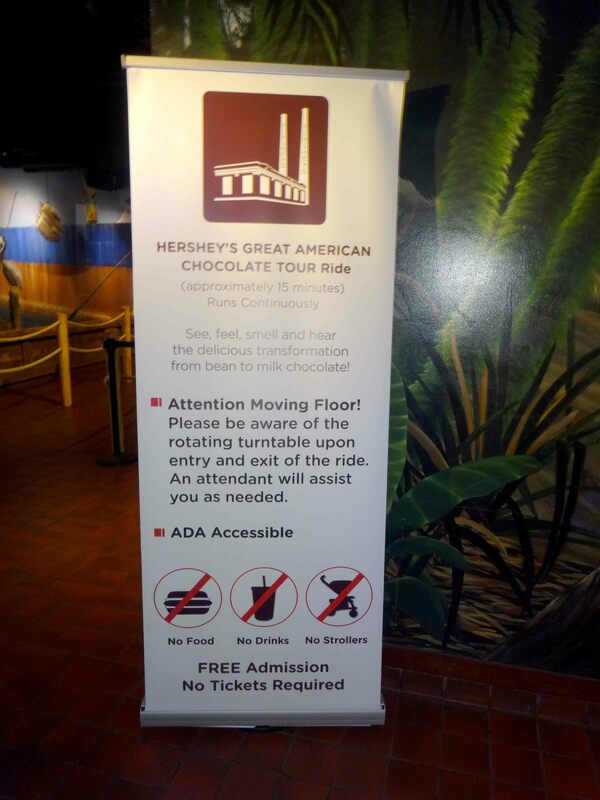 Just as I mentioned on Sunday, the main entrance to Chocolate World’s Tour Ride was indeed closed off and re-routed. 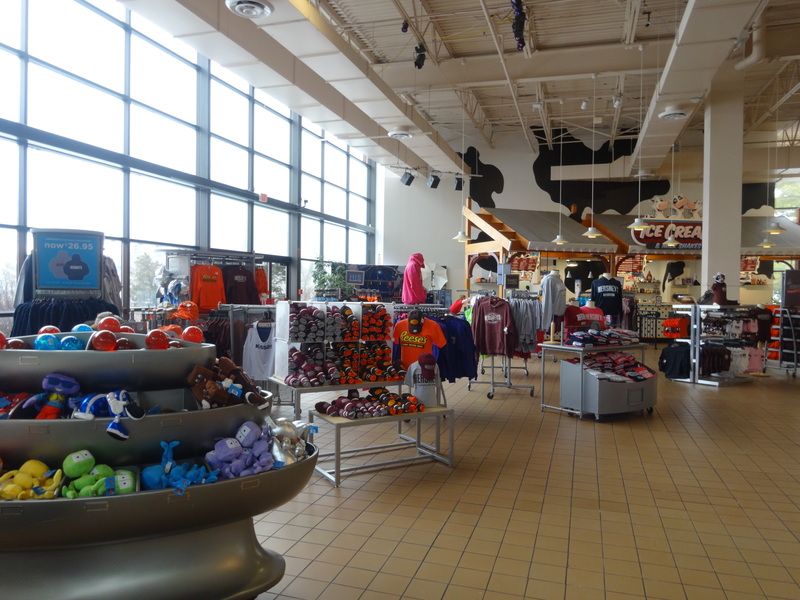 Elsewhere in the building, the T-Shirt/ Apparel area where KissWorks used to be has been relocated yet again to the Food Court where the Candy Cottage was. 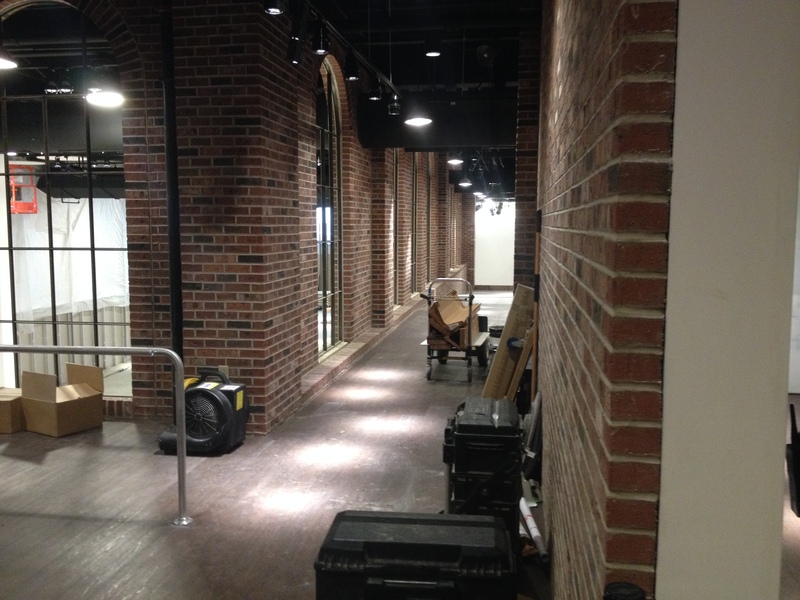 This has given the area between the Bake Shop and lobby more room for people to walk between the areas. 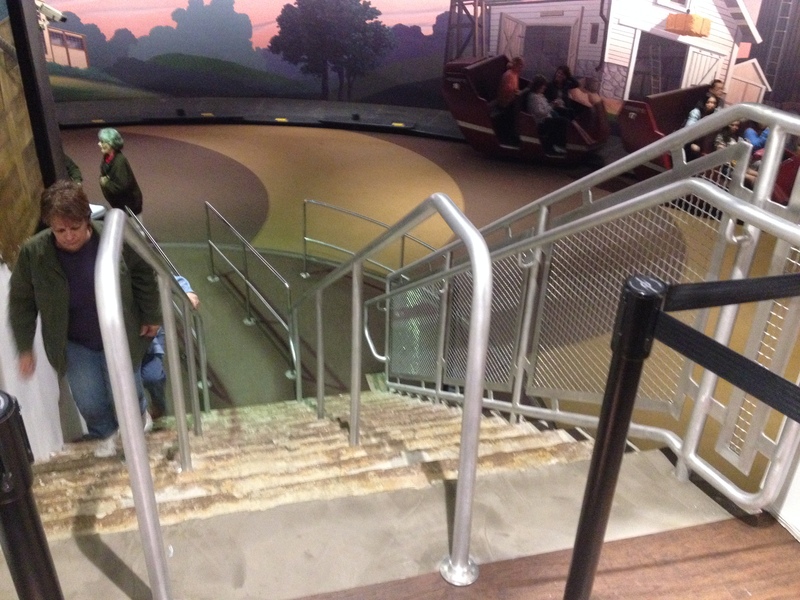 The video version of the Tour Ride was also moved here from its former spot behind the loading area. The Construction wall within the lobby has been expanded across the Tour Ride entrance. At this point, it really gives you the sense that this is a pretty big undertaking. 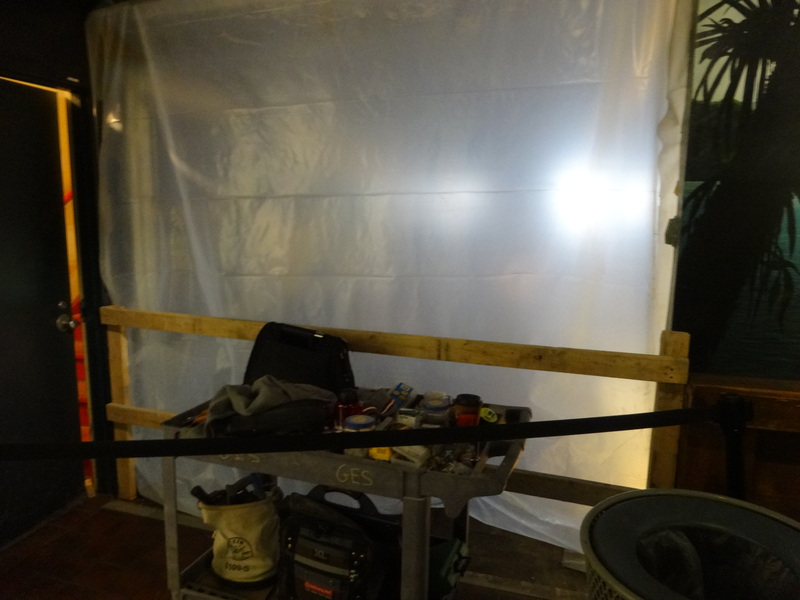 Some utility-work has gone up in the hallway. 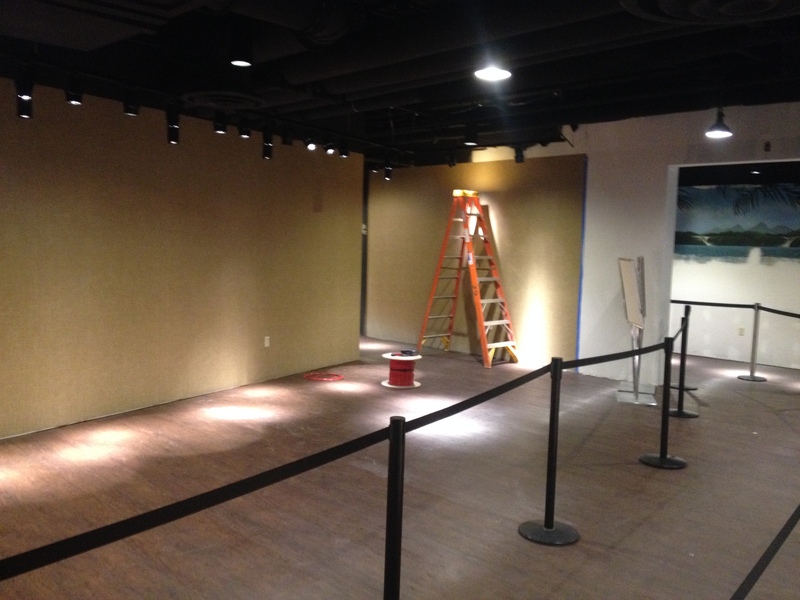 The Apparel area has been relocated to the Food Court. 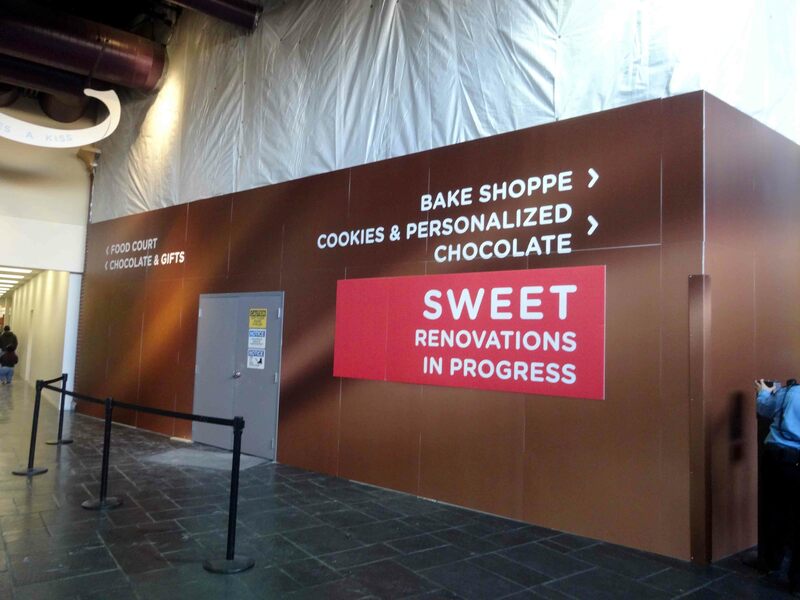 More walls have gone up over by the Bake Shop. 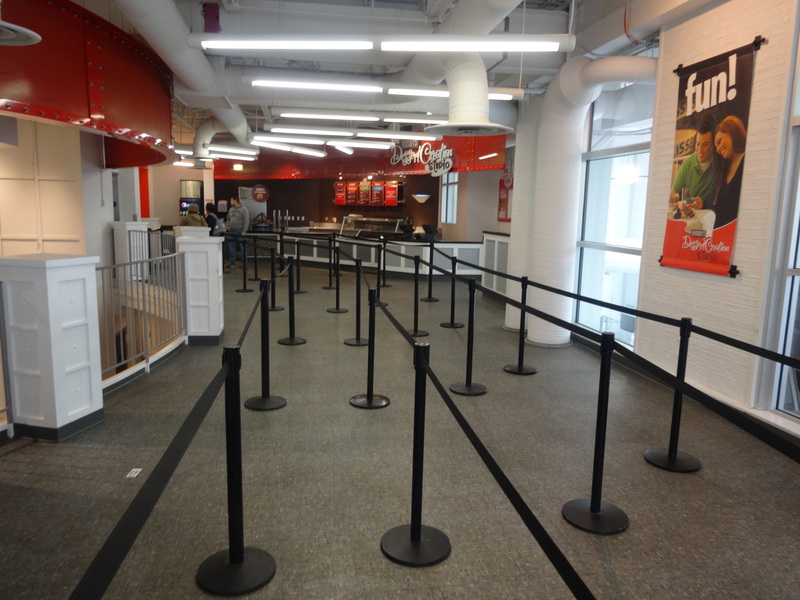 …and wait in this switch-back queue area (if there is a line). 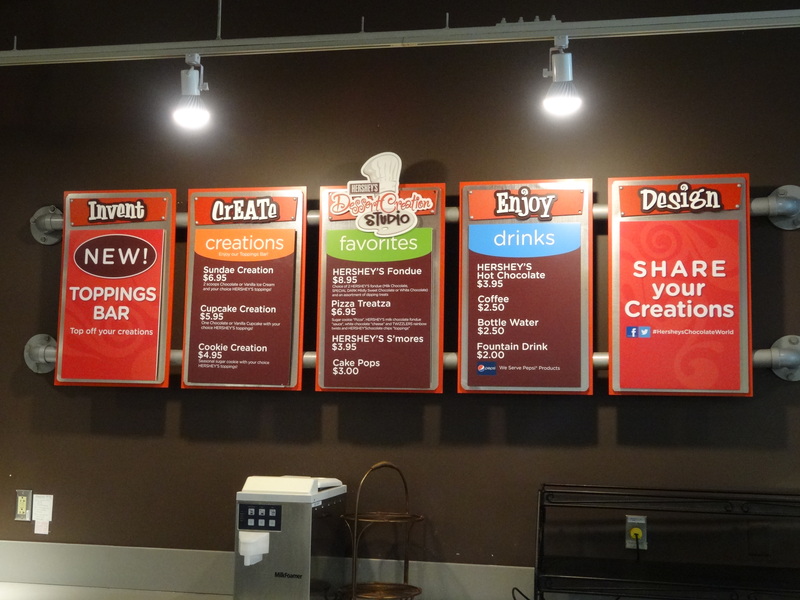 While waiting, you can take a look at the Create-Your-Own Candy Bar attraction. For those wondering what the Dessert Studio is, here is the menu for it. Of course since the area is being used for something else, it isn’t open right now. 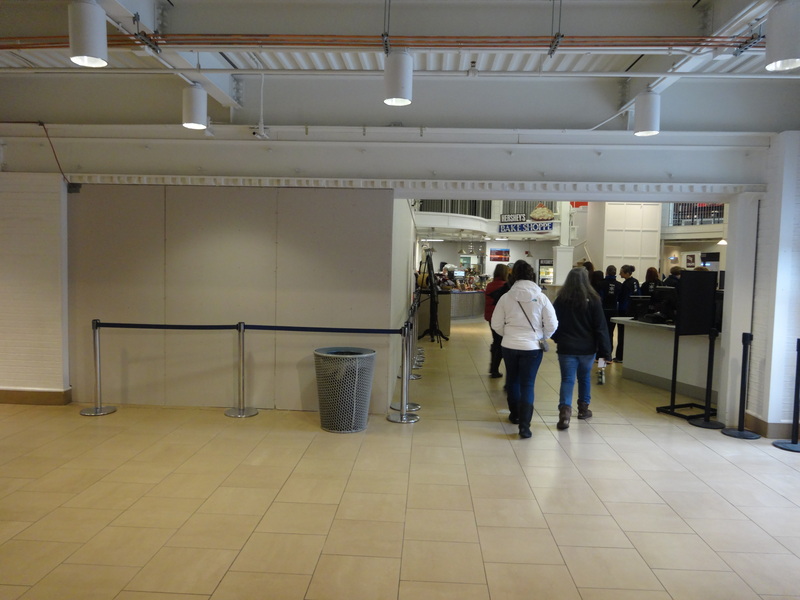 Next, you make a right through that door, enter a bland hallway, make a left, then re-connect with the former queue line. 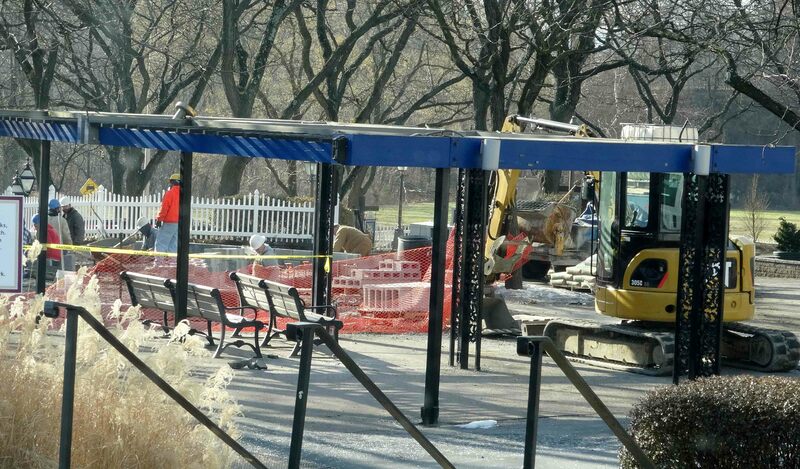 Looks like work on removing the former entrance is progressing. Upon exiting, you can view your ride photo on that tiny iPad (the area across from the Bake Shop is where you can buy them). 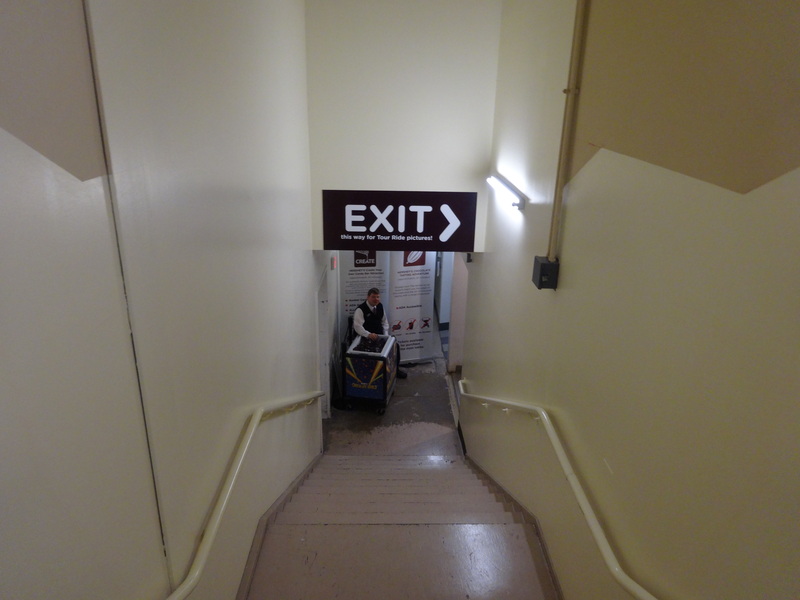 To exit, you just go back into that hallway, go down the stairs (don’t forget you free sample! 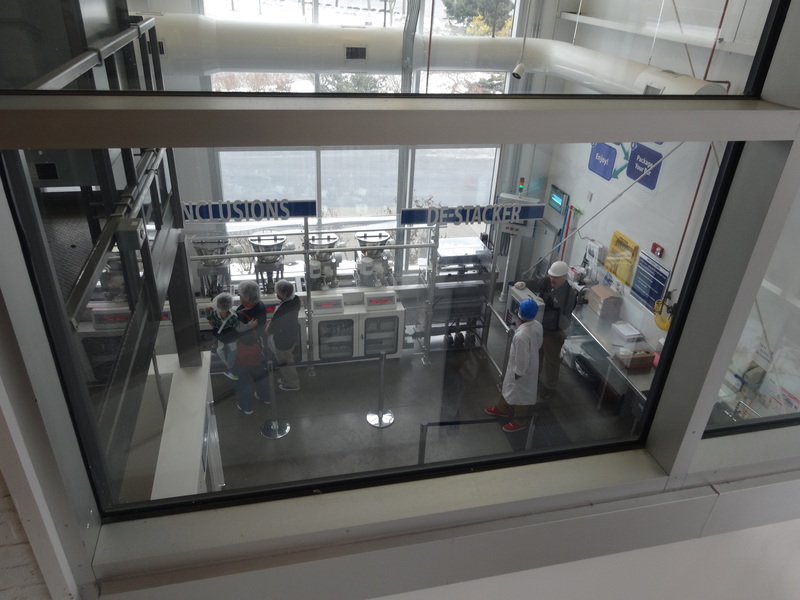 ), make a right and exit next to the Bake Shop. If you don’t feel like riding, don’t worry. There’s always Bench: The Ride! 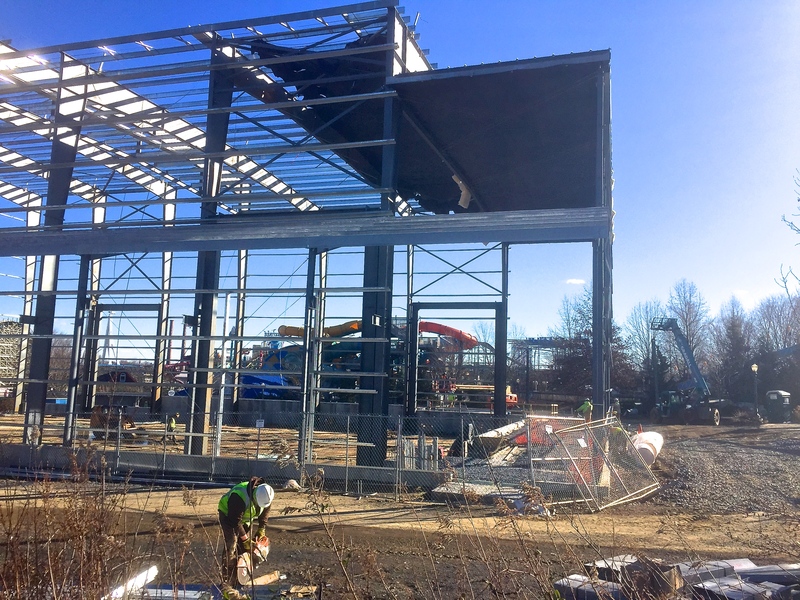 Over at Hersheypark, work still continues on the now confirmed Ticketing Services building going up in Tram Circle. 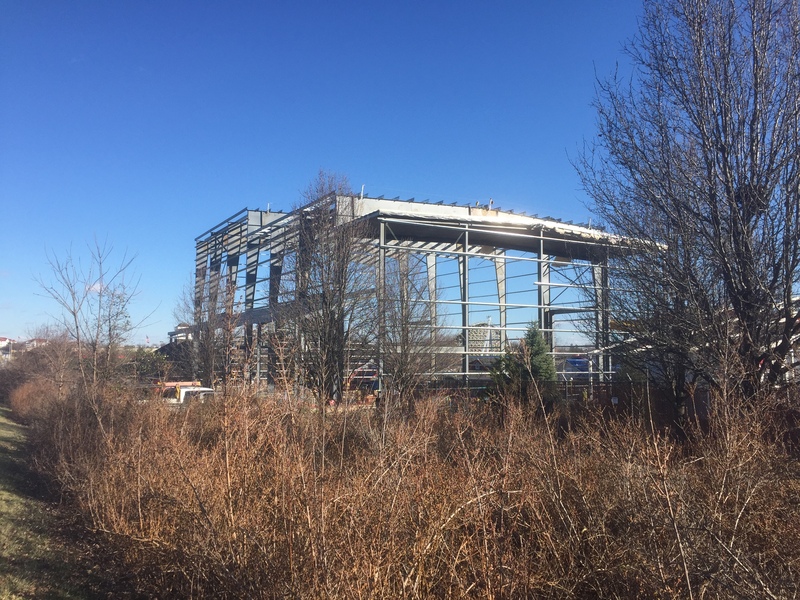 Nothing really new to report about it, but as for the games building in The Hollow, it looks like workers are in the process of removing the roof and much of the side of the structure. 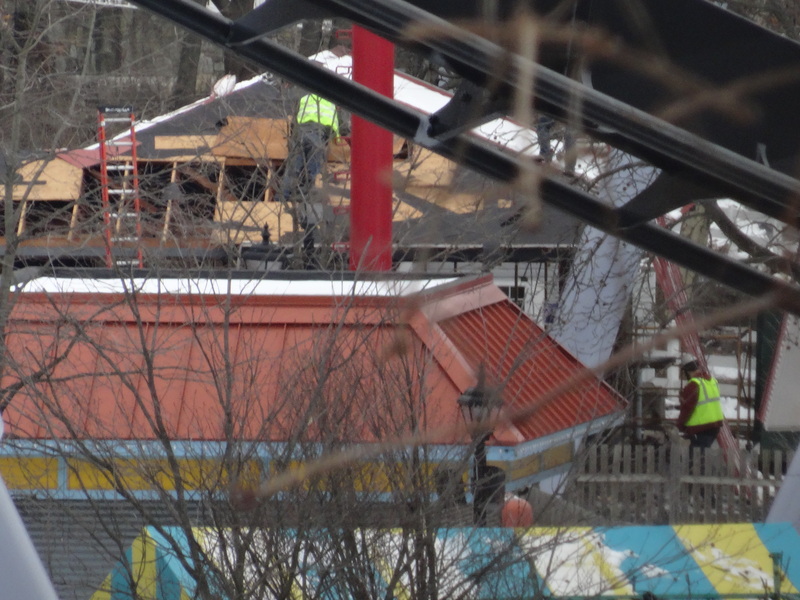 Elsewhere in the park, a large crane is present by Great Bear, but that’s it. 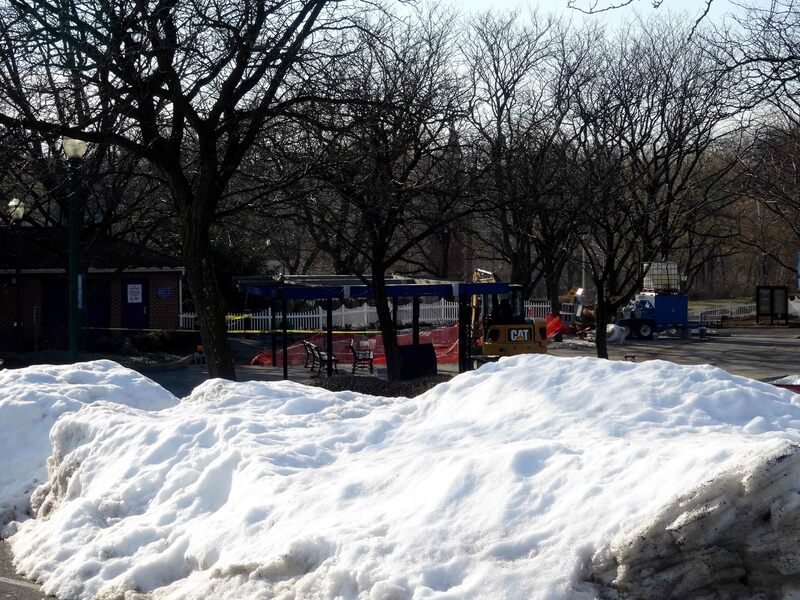 Nothing really new happening with the ticketing building. Looks like some off-season rehab work. Removal of the old games building looks to be half-done. 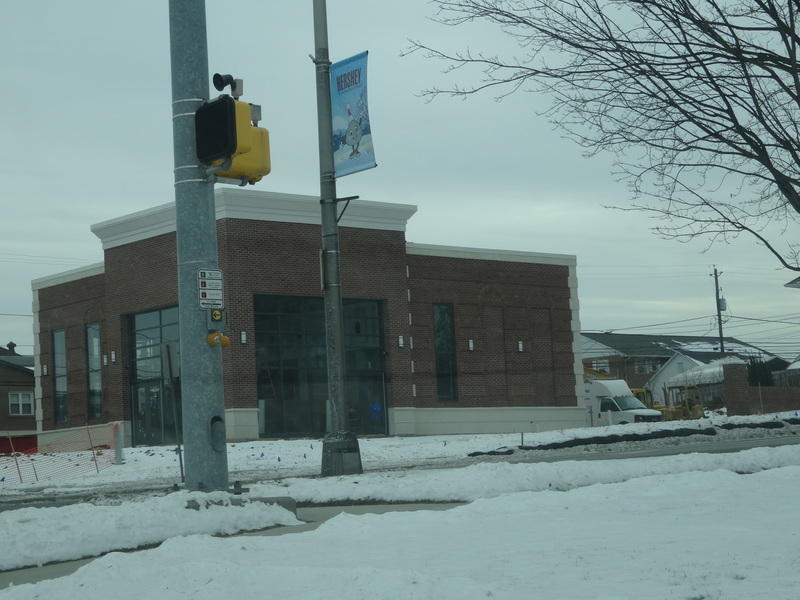 Finally, it looks like work seems to be progressing to an end with the Chipotle Restaurant in town. There was quite a bit of talk about people saying that it would ruin the atmosphere of the town, but honestly, it looks just about the same as the Rite Aid a block down the street. 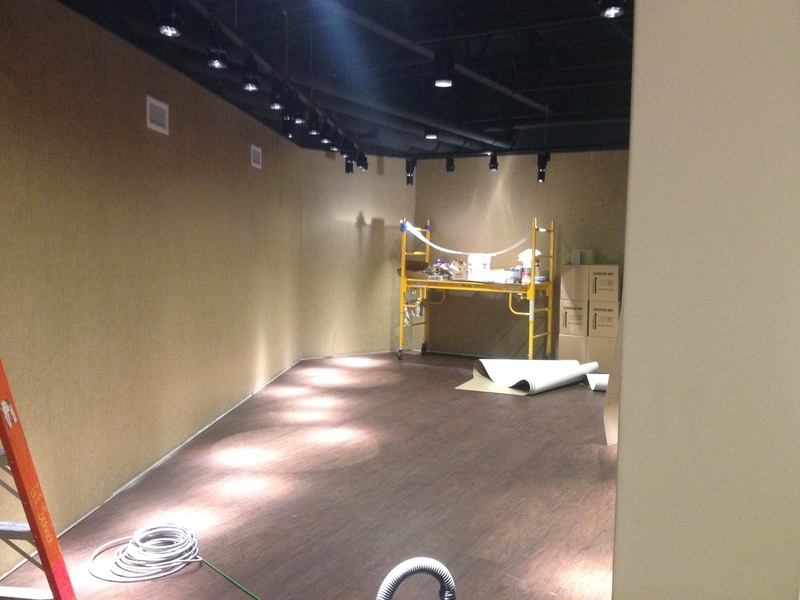 Chipotle is nearly finished. Shouldn’t be too long until it is open. Howdy guys, its time for another off-season update! 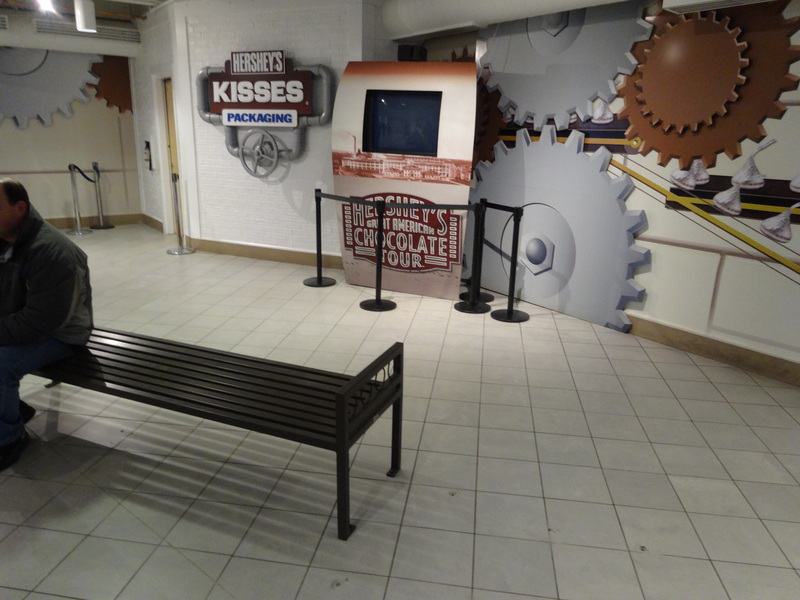 Last week in the Facebook page, I posted the first off-season update for the winter and it confirmed that much of the retail area of Chocolate World was going to be renovated with a new appearance debuting for Spring. 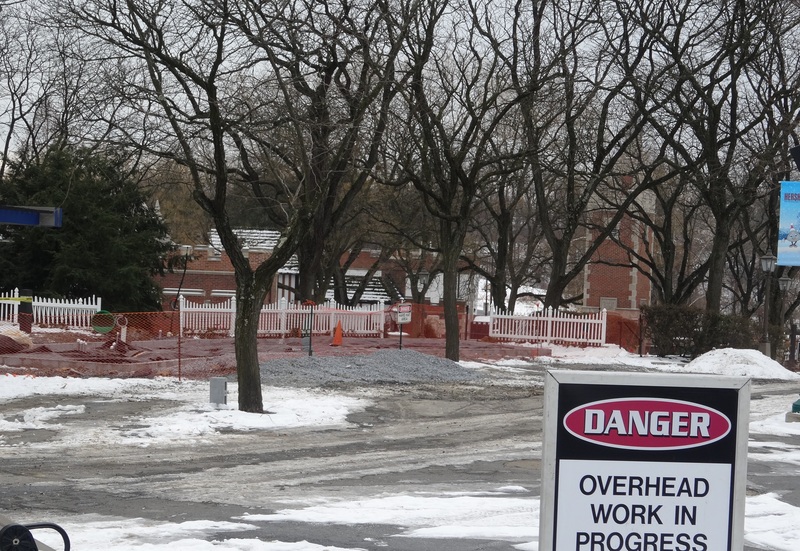 We also discovered that the former Group Sales building was in the process of being removed. This week, we’ll revisit these locations to see what’s new and take a peek from Park Blvd to see if any work has begun on the new Tea Cups and Sweet Swing in the Hollow. Unfortunately given where it’s located, Cocoa Cruiser might be a tough one to follow. On to the photos! Since last week, it seems that there is nothing left of the Group Sales building in Tram Circle. In addition to the removal, it looks like work on rebuilding has started. The base for the building at this point looks similar in size to the old one. The former shade arbors still exist, but the roof has been taken off. Since half of Tram Circle and Tudor Square is currently a construction area, we’re going to stay to the upper part to get updates for now. Much of the Candylane displays have been packed away for the season. Let’s check out Chocolate World. Just as I got there, finishing touches were just being added to the new graphics on the construction walls in the lobby. 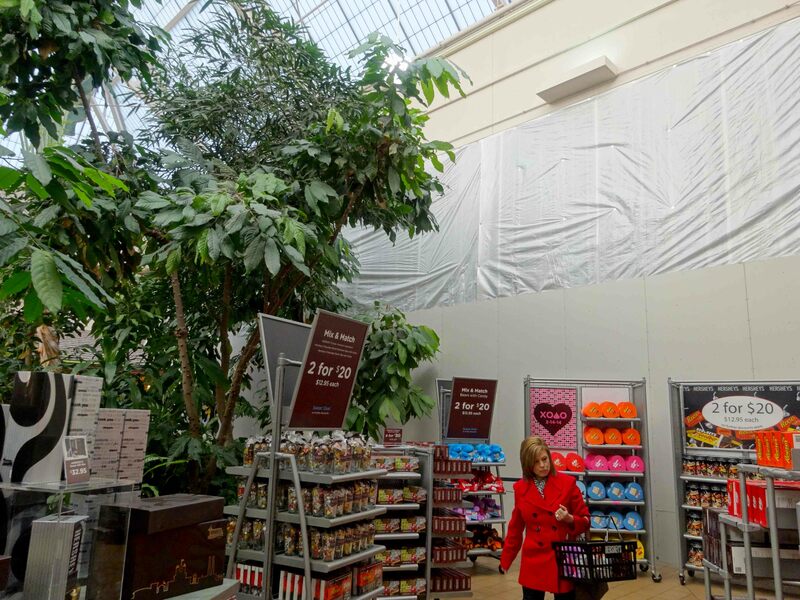 In the Food Court, the walls are just plain pieces of drywall. The original entrance and exit has now re-opened from the looks of it. Here’s a side note; Chocolate World is hosting Zumba and some family activities during Saturdays and Sundays in the month of January (and Jan. 20th). 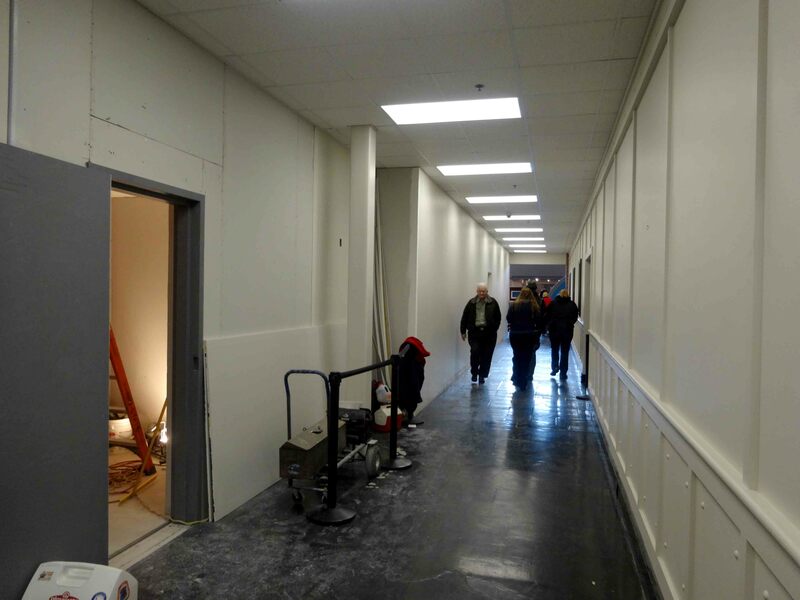 Work is currently going on in the hallway corridor that links the lobby to the food court. 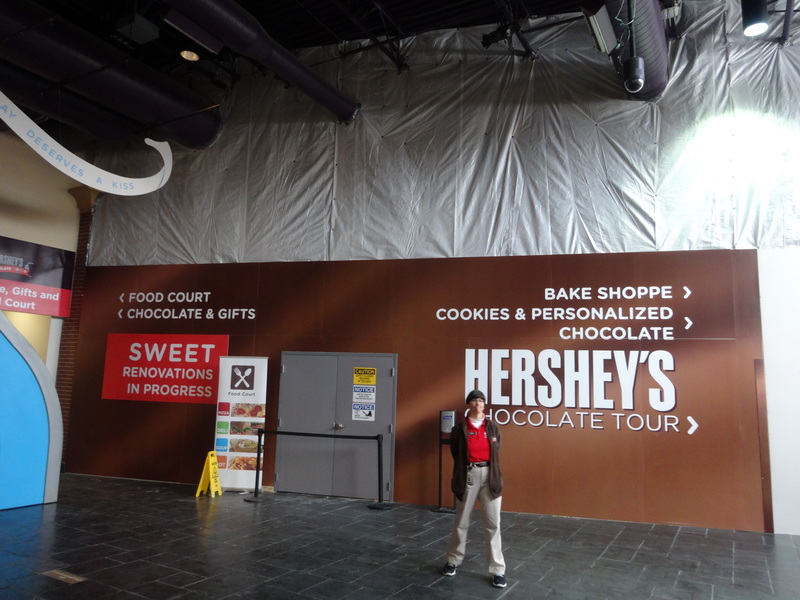 I think this might actually get more people over to the BakeShop area of the building as I hardly ever see many people casually venturing over there (besides the Candybar attraction and Dessert Studio). 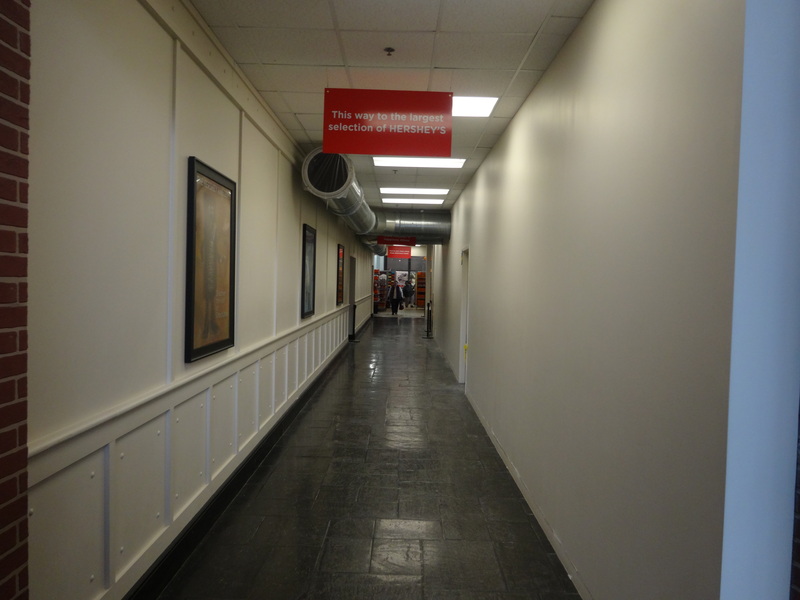 The lobby never really had any directional signs before construction began. The Tour Ride’s queue is still pretty much the same as last week. I guess you could technically say that this is the entrance right now since the exit shares the same path starting here. Let’s check out The Hollow from along Park Blvd. The older Hollow Games building is still standing and looks like nothing has happened here yet. Then again, the Tea Cups and Sweet Swing are pretty simple and probably won’t take all winter to build. We still have quite a bit of off-season to go, so be sure to like us on Facebook or follow us on Twitter and the blog for the latest updates leading up to Springtime in the Park! Lets take a look around one of the area’s most beautiful hotel, The Hotel Hershey.The property is one of only three hotels in the state of Pennsylvania to receive a Four-Star rating by Forbes Travel Guide. Walking up to the hotel, you get that Mediterranean feeling that seems to radiate off of the building. Just inside are a few stores that welcome you. One of them was the Cocoa Beanery, which is set up similar to a coffee shop and bakery. Many of the desserts are just mouth-watering to look at such as this one. Next door is a candy shop called Sweets that sells a wide variety of macaroons and cupcakes, which you have the opportunity to decorate your own. This shop sold comfy home decor. There was also a jewelry shop, seasonal shop, and others as well. The staff is the friendliest that I’ve ever seen at a hotel. They hold the door for you as you enter the place and are always willing to help you if you have a question. Here we are, the famous fountain lobby. This was my first visit to the hotel and it’s appearance blew me away. No small amount of detail was skipped, as you can see. Connected to the fountain lobby is the famous Circular Dining room. When M.S. 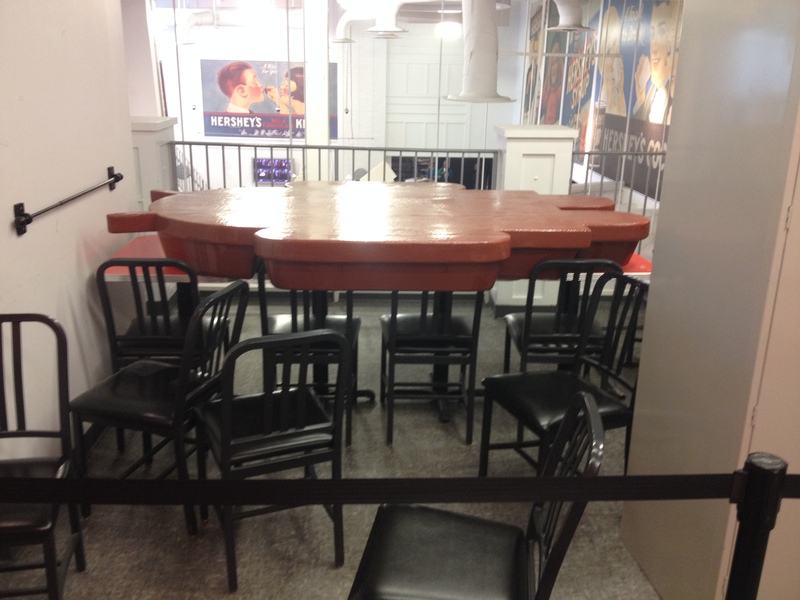 Hershey built it, he wanted nobody to have a bad seat. As you can see from how open it looks, his idea makes sense. Behind the hotel is an area called the Formal Gardens that feature two reflecting pools. Behind the Formal Gardens is where the skating Rink, Woodside Cottages, pool, and Hershey Harvest restaurant are located. Come spring, this area will look totally different. Turns out that the Formal Gardens came before the Hotel Hershey. To the left is the Chocolate Spa building. Looks like there is no skating today. The Hershey Harvest is one of seven dining locations at the hotel. The pool looks like it would be awesome in the summer. It has two water slides, zero-depth entry, many water elements, and is that a fountain on the concrete to the right? Here is an overview of the slides. The Woodside Cottages were added in the 2009 Grand Expansion and has a nice setting with the view of the Blue Mountains behind them. But with a hotel that has a view like this, no wonder why the Hotel Hershey is such a highly recommended place. 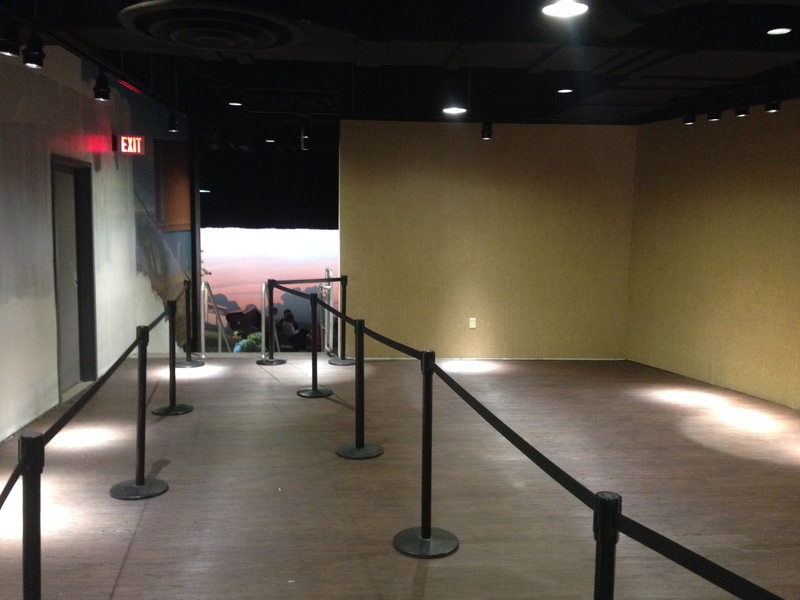 This is only the start of what Keystone Thrills has in-store and much more is on the way!